Chair Hal Somers and Foundation Executive Director Joanne Sellers spoke at our weekly meeting today. The foundation works closely with their partners, including health care professionals, donors and volunteers, to encourage the community to support exceptional patient care at the Miramichi Hospital. They strive to enhance local quality health care services by raising funds for the purchase of equipment; erection, extension, or alteration of buildings; provision of health care for patients; education and training of professional, non-professional and technical personnel; and research. 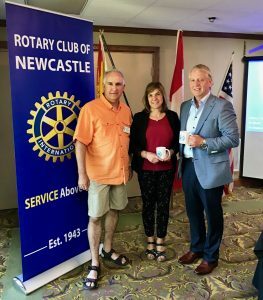 Thanking Hal and Joanne is Fellow Rotarian Gary Foley.